If you are in the United States during Holi, which is celebrated in almost every state, all through the spring with events featuring gulal and dance, participate in one of the events near you. Arguably one of the most popular Holi festivals in America, the Festival of Colors was started back in 1989 in Spanish Fork, Utah. 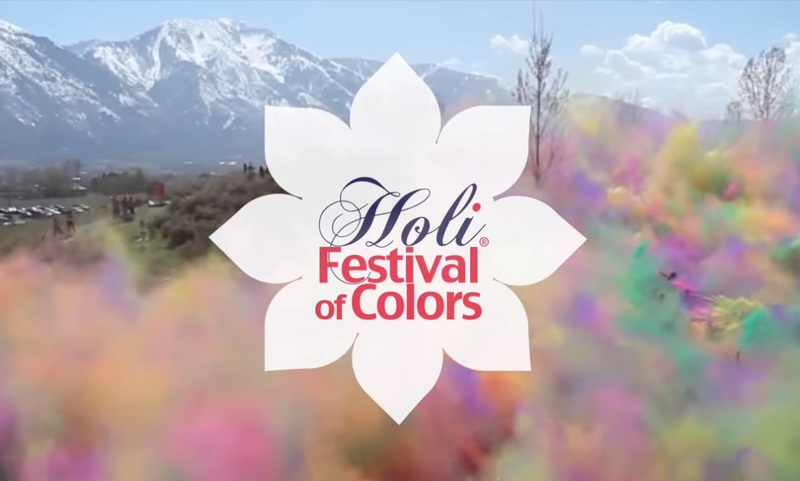 Owing to its popularity, there are now Festival of Colors Holi events across many cities in the southwest in states such as California, Utah and Nevada. Each year, the festival attracts a vibrant crowd of merry makers comprising, not just Indian Americans but people across ethnicities. In 2017, some 35,000 revelers attended the event at its Spanish Fork, Utah, location alone. The two-day festival is played with dry, environmentally safe and skin-friendly gulal (dry color powder). The organizers describe it as an interactive Holi with live bands, DJ’s, Yoga teachers, cuisine, free hugs and lots of love. A community festival by ISCKON of DC has been a Washington tradition for Holi lovers. The well-organized event has everything that a footloose reveler may want. They provide free shuttle services to and from the festival site. It also includes free family photo, color packs at nominal prices and most of all a thali with Indian delicacies. Check this out if food and celebration go hand in hand for you. What is Holi without a cup of kadak chai and Indian inspired food truck? There would be all these and more at the Holi celebrations by the Phinney Neighborhood Association of Seattle. Described as the festival of colors, or the festival of love, the Holi celebrations at Phinney Center in Seattle also comprises throwing handfuls of colored powders on each other and listening to dance and music by locally acclaimed performers. An exuberant festival promoted as a family event has become one of the most popular Indian events in West Virginia. Bring your family and a lot of cheer. Touted as the largest Holi celebration in the country, it’s a perfect Indian mela complete with colors, rides, concerts and street foods. If you are in Houston, get a slice of this India meets America tradition. Being promoted as the New York City’s biggest festival of colors party, the annual party, according to the organizers, has been a sellout for the past five years. The brunch party has colors, food and performances. Described as unity in diversity, this is New England’s largest Holi event. You can enjoy kirtan, dance, drama, aarti and prasadam along with devotional chanting with world instruments. Home to one of the largest Indian American communities in the United States, the Garden State has a Holi celebration in almost every neighborhood. From Holi parties in Jersey City to Freehold, if you are in New Jersey, it’s unlikely you will miss the tradition. At New Brunswick in Central Jersey, the 10th annual free Holi event comprises music, dance, raffle, henna and of course colors. Presented by ComEd, this free public program, Navy Pier’s Holi is a classy affair. There is color throwing at Miller Lite Beer Garden. A special reception at Aon Ballroom sand music and dance performances will follow at the ballroom. The color filled event would also mark the 60th year of Hanford Breakfast Lions. A great family event to mark the beginning of spring.